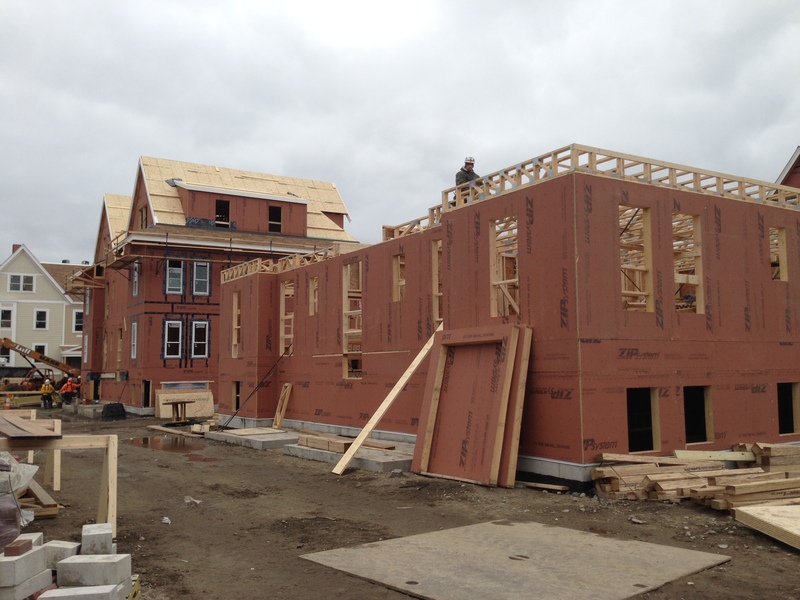 Work is now underway at the second phase of Charlesview – The Town Homes at Brighton Mills. 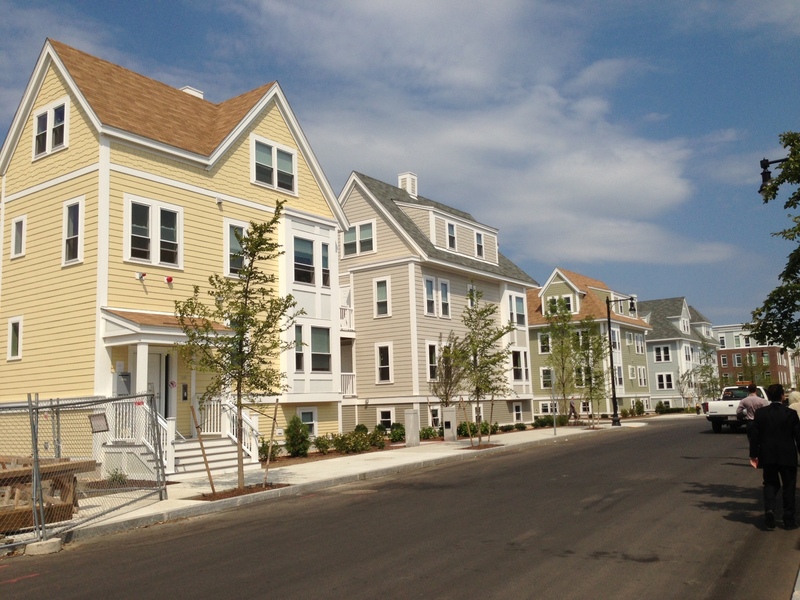 The Town Homes will include 20 homes for sale at affordable prices to moderate income families. There will be ten 2 bedroom and ten 3 bedroom units available, with five of each bedroom size affordable to families earning 80% and five of each bedroom size affordable to families earning 100% of the area median income. This development is the fulfillment of a promise made to the community to include affordable homeownership in the new Charlesview neighborhood. Follow construction at http://thbrightonmills.wordpress.com/. For sales information, please visit www.thbrightonmills.com which will be updated as marketing begins in earnest late this spring. After 26 months of construction and many years of planning and negotiation, the Charlesview Residences is nearly complete. On Friday, August 30th, the City of Boston granted Certificates of Occupancy for the last 5 of the 22 buildings to come on line. That milestone marks the completion of major construction work on the site, leaving only some landscaping, common area items, punch list items, and final paving to be done. 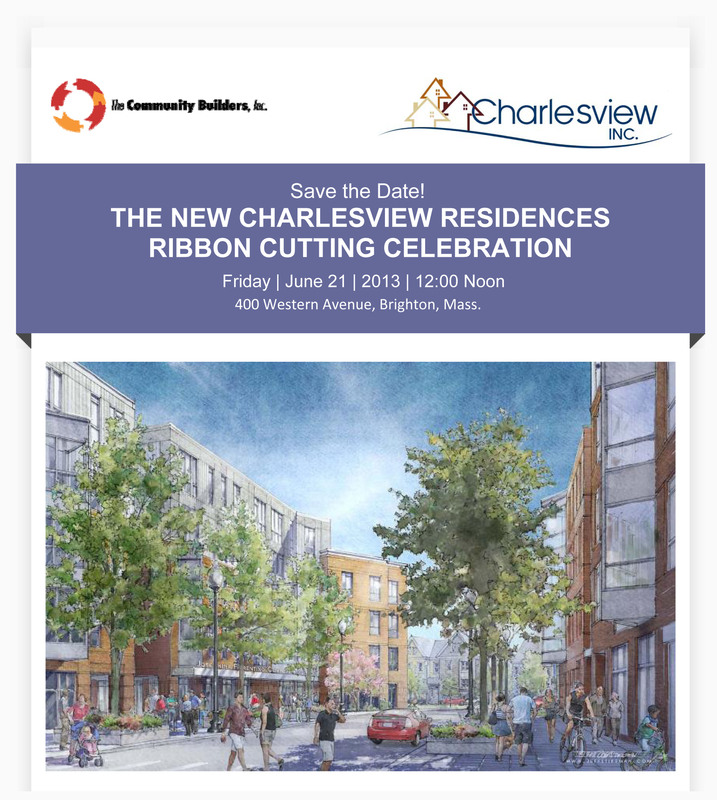 This Friday, September 6th will mark another major milestone – the completion of resident relocation from the old Charlesview Apartments in Barry’s Corner to the new Charlesview Residences at Brighton Mills. Housing Opportunities Unlimited (HOU) worked feverishly through the summer with tremendous help form Charlesview’s property management to move approximately 200 households in only 11 weeks. 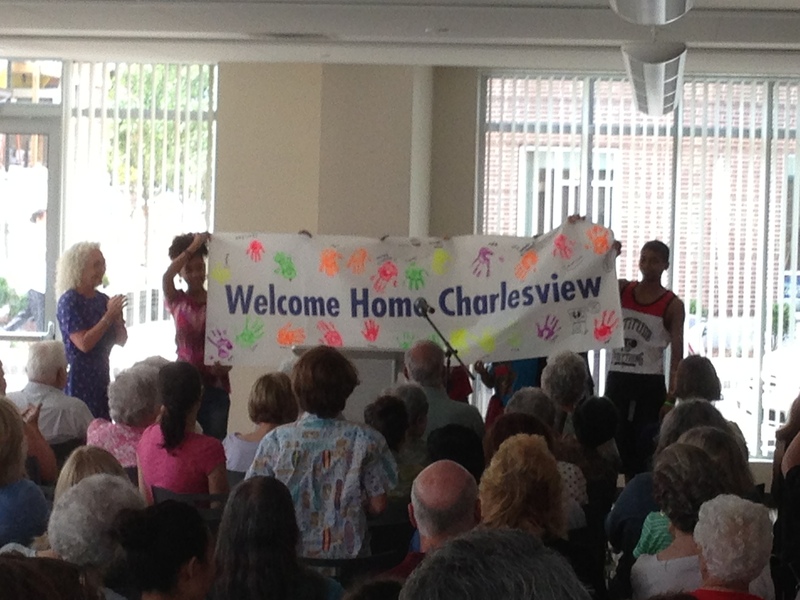 The families and individuals who have called Charlesview home for years worked hard to prepare for the moves and have been incredibly patient with the whole disruptive process of moving and the inevitable bumps in the road. Over the next month, these long time Charlesview residents will be joined by additional new residents from the long waiting list until the Charlesview Residences’ 240 homes are full. JM-A’s construction team will work diligently over the next few weeks on the final remaining items. At the same time, everyone involved in the property will prepare for HUD’s REAC inspection – which will enable the property to participate in a major subsidy program. Peabody Properties will work to lease up the remaining homes from the waitlist while keeping the property running well. All of the financial participants in the development project will work towards final closings to fully transform Charlesview from a construction project to a healthy, operating property. 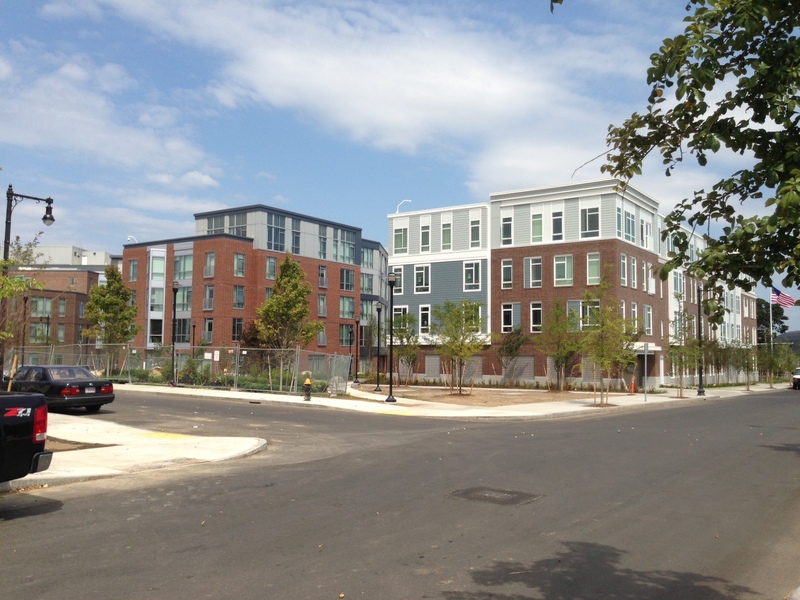 The two items perhaps most important for the whole community will be the growth of programming at the Josephine Fiorentino Community Center and the construction of the Brighton Mills Homeownership townhomes. Charlesview, Inc. is ramping up to bring a variety of communiity programs to the Fiorentino Center. 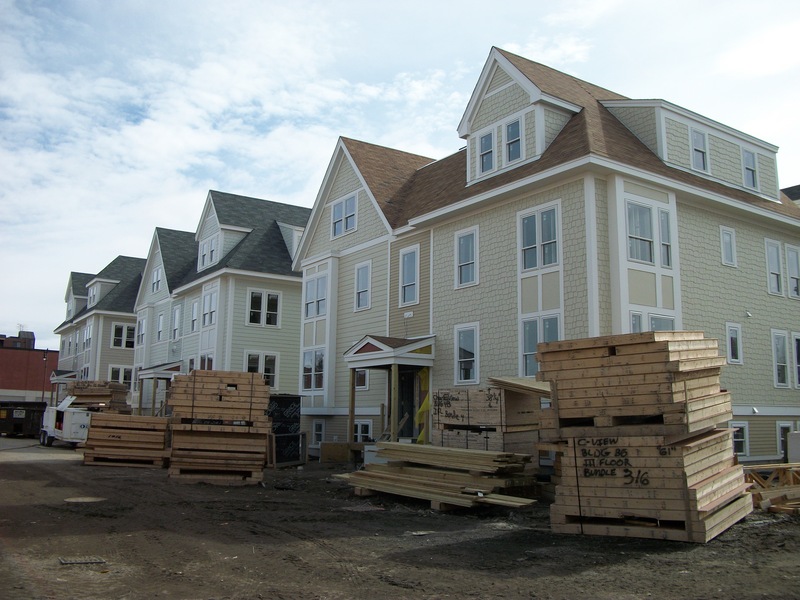 The Community Builders is working diligently to follow through on its promise to provide middle-income homeownership opportunities at Charlesview by beginning work on the Brighton Mills Homeownership townhomes on parcels on Holton and Litchfield – stay tuned over the fall for updates on that project. 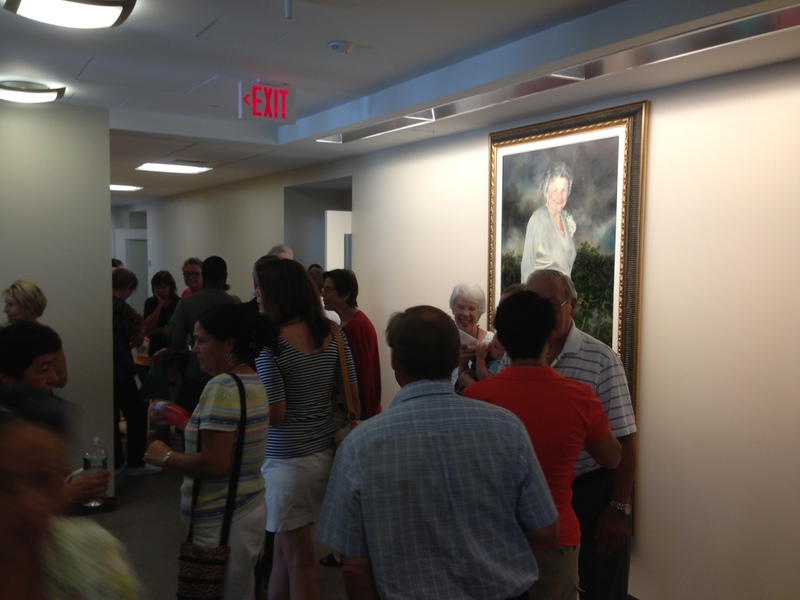 This past Sunday, roughly 250 people came together to celebrate the Josephine A. Fiorentino Center at Charlesview. 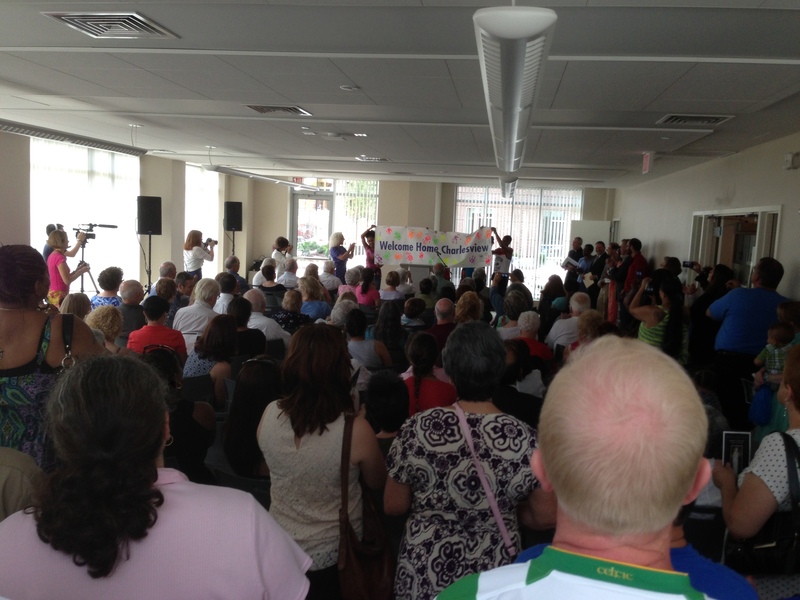 As many times as I have been in the Community Center space as it was under construction and coming to completion, the Center felt new and alive as residents of Charlesview, their Allston-Brighton neighbors, and well wishers from farther afield crowded into the space. 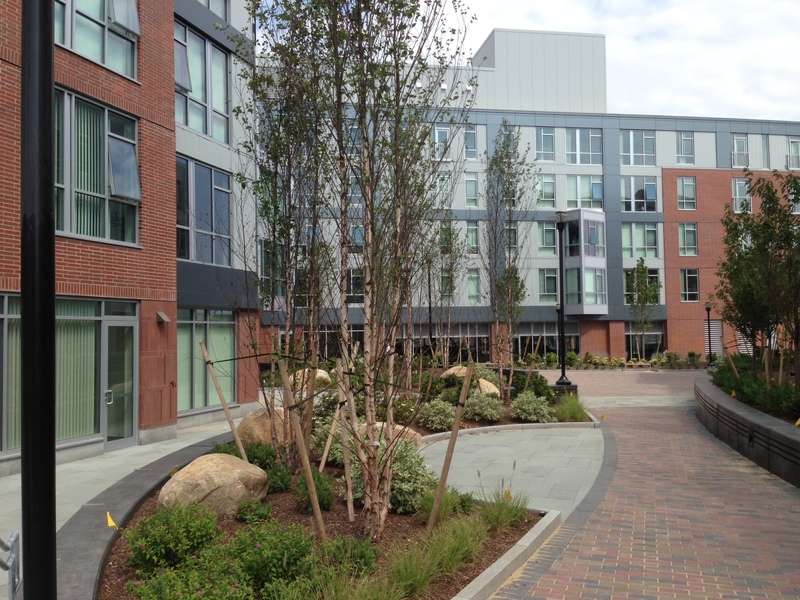 The Fiorentino Center is the first neighborhood community center of its kind to be open in North Allston-Brighton. 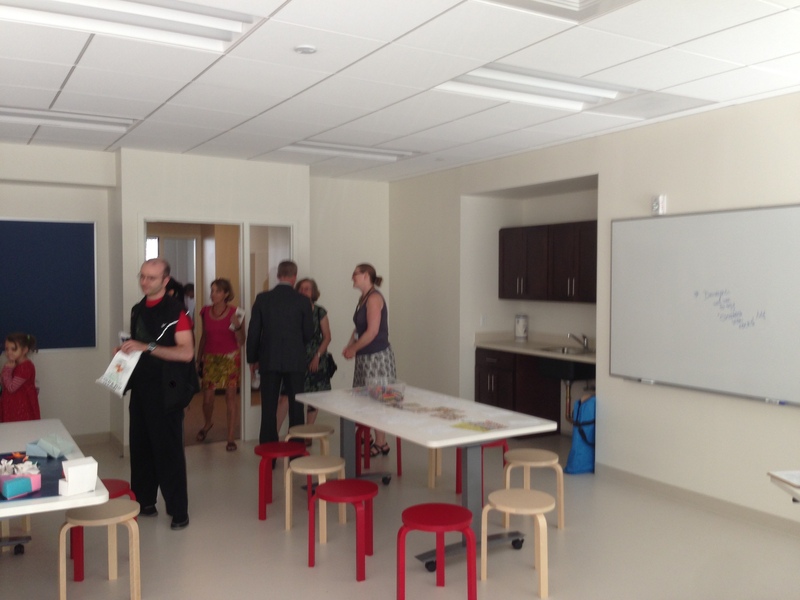 It features a computer center with free wi-fi, desktops, and laptops donated by Google (who are also an investor in the Charlesview development), an arts room, adult learning classroom, and a large meeting space. 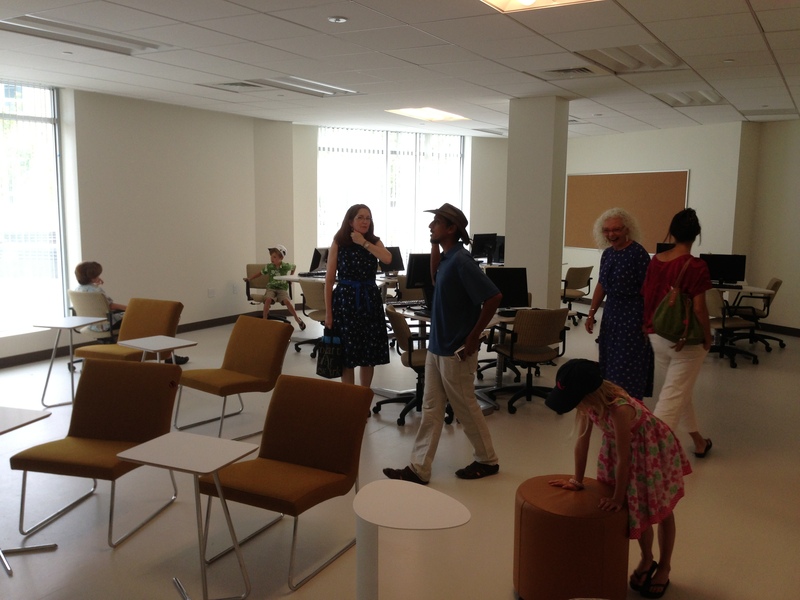 Beginning this fall, the spaces will be filled with progammming every day of the week as Charlesview, Inc’s Executive Director Jo-Ann Barbour has been busy lining up programming with partners from throughout Allston-Brighton. Construction is in the throes of its last, exciting stage. The site looks different from one day to the next. The mid-rises on Western Avenue (E1 and D1) are complete. The mid-rise on Telford St (E2) is nearing completion. All of the townhomes have been framed, except for the last two behind the D1 mid-rise on Justinian Way. 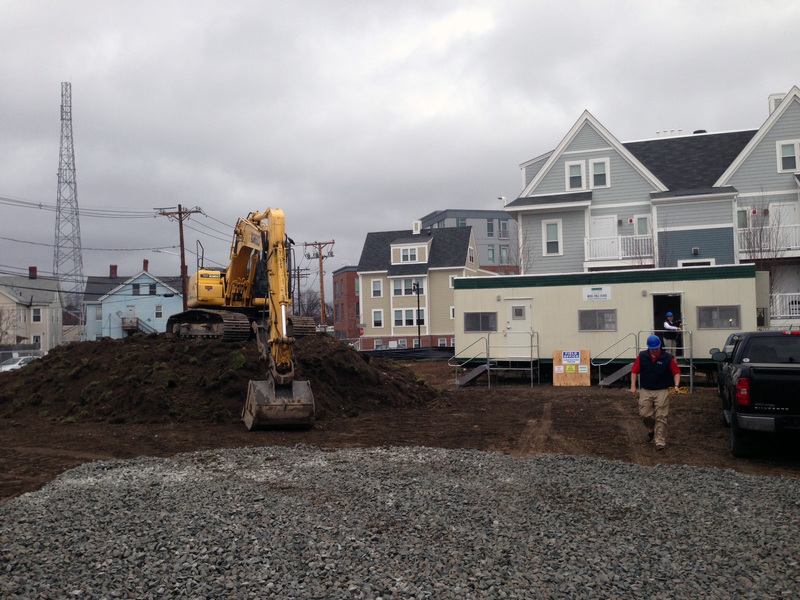 Site work is progressing rapidly, and within two weeks this neighborhood will have new roads and a new park. By our ribbon cutting ceremony on June 21, the construction site will be reduced to the D-block townhomes, B-block, and a staging area on C-block. Resident move-ins will begin on the rest of the site on June 24th. The relocation of residents from the existing Charlesview at Barry’s Corner and the move-ins of new residents will continue through the summer and finish up in the first week of September. Move-ins will be timed to minimize disruption. Moving trucks will be located on the new streets. Charlesview move-ins won’t feel anything like that first weekend of September normally does in Allston-Brighton. But soon, everything else about Charlesview will just feel like everyday, normal Allston-Brighton (whatever that is). With construction so far along, we can see how dramatically the new Charlesview Residences has changed the Brighton Mills site over the last two years. Most people in the neighborhood can still remember the shopping center with Frugal Fannies and K-Mart ,an old McDonalds, and a tremendously large parking lot. 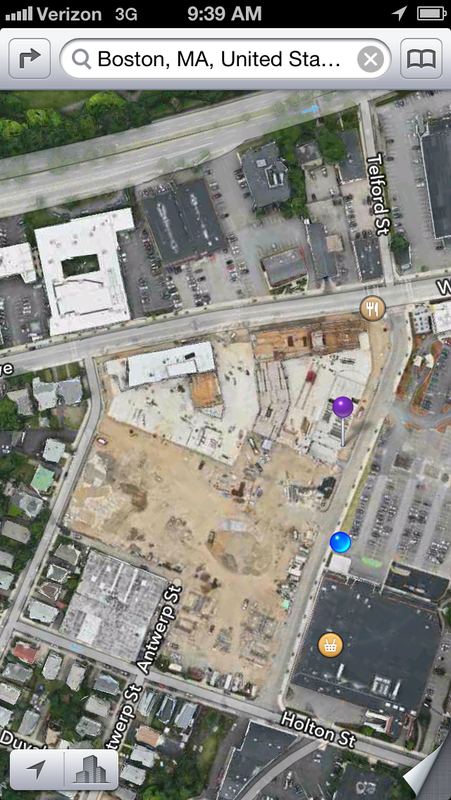 In fact, if you look at Google Maps you can still see a satellite image of the old shopping center. Apple Maps has recently released the first mapping service satellite image of the new Charlesview Residences, showing the prepared site, the topped off underground garage, and the beginnings of the mid-rises on Western Ave. But, what was there before all of our construction and before the suburban style box store shopping center? This excerpt from a 1909 map shows what has and hasn’t changed a lot in the last century. A large cordage (rope) factory operated on what remains the Brighton Mills Shopping Center and a portion of what is now the Charlesview Residences. 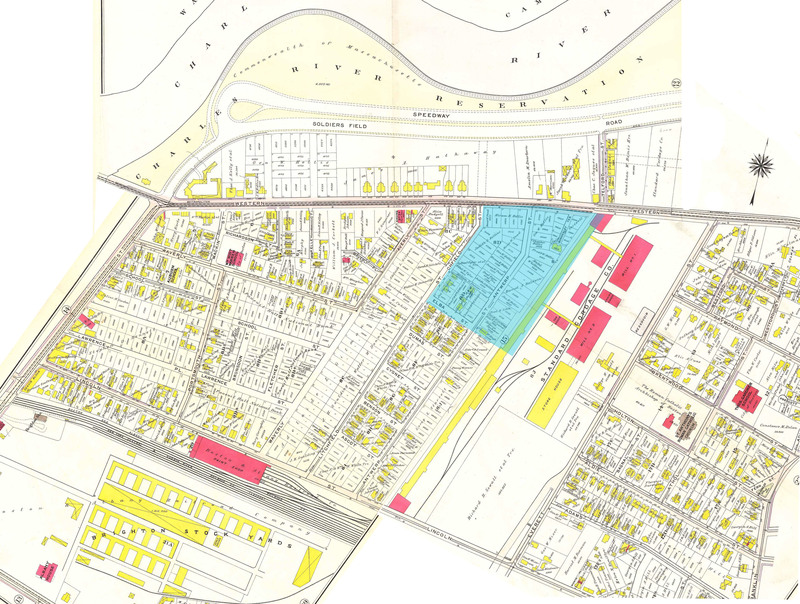 Most of the Charlesview Residences site, highlighted in blue on the historic map, was laid out for residential development in 1909. This part of the city at the time was both a rapidly growing “streetcar suburb” and a center of industrial jobs itself. The small lot, single and 2- and 3-family homes that we love were built quickly along side streets like Antwerp and Litchfield. You can see many plots on this map that still lack the yellow square that denote the houses. Just across the railroad tracks (now the MassPike and tracks) were the massive Brighton Stock Yards, which provided meat to the city and beyond. 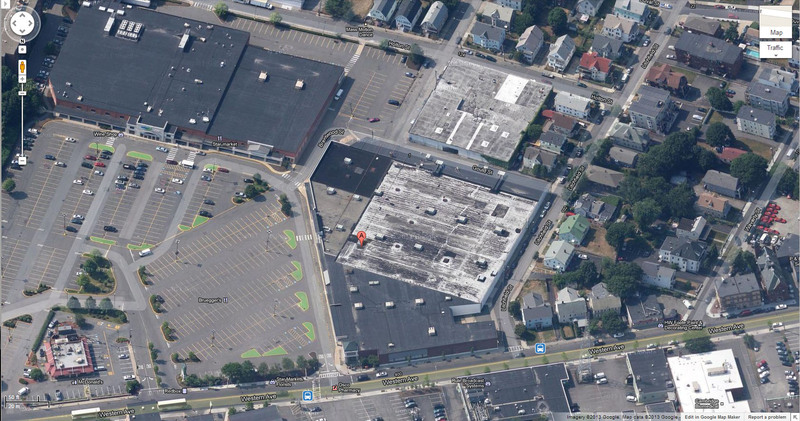 Today, that site is being redeveloped by New Balance into a major mixed-use center. Charlesview 1909. Click to enlarge. Cities and neighborhoods always change and evolve. We’d like to think that bringing homes back to the neighborhood continues the work of building a Boston neighborhood urban fabric that was underway when this 1909 map was made. 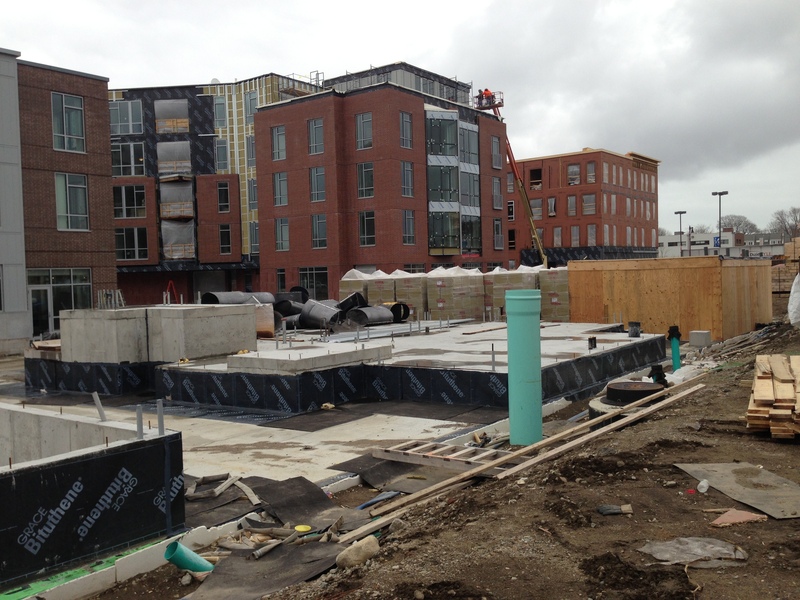 Despite several severe weather events through the winter, work at the Charlesview Residences is moving along quickly. This March is a fascinating time on site, with a range of construction conditions from finished units all the way down to bare foundations ready to be framed. 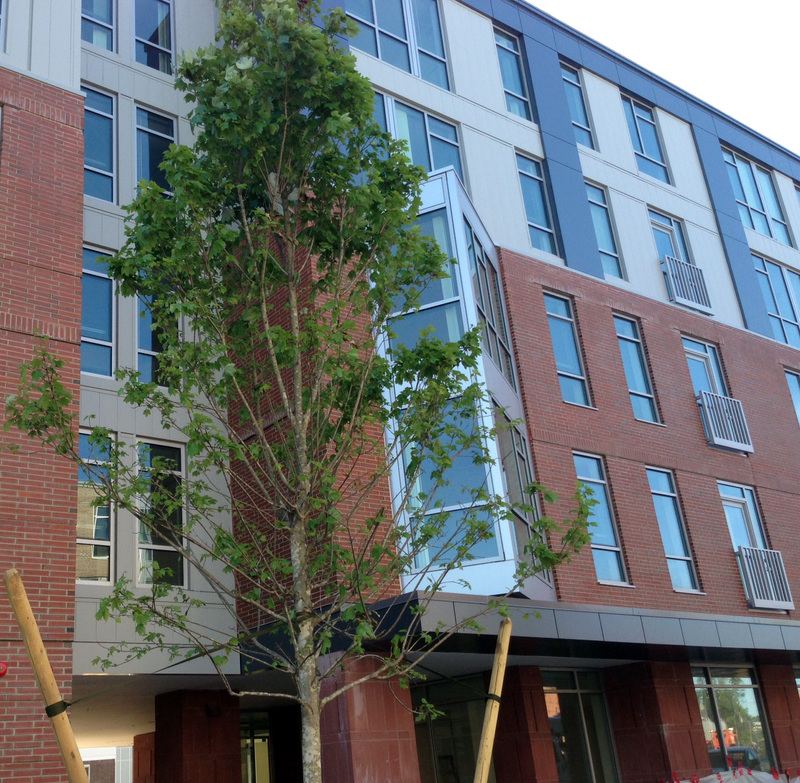 Unit 202 in Building D1 was the first to be completed, and the construction, architecture, development, and property management teams tested their punch list process on this unit. Punch listing has now moved through all of the 2nd floor units and will proceed to the 3rd floor next week with a goal of one floor per week until D1 is finished. The interiors of apartments in Building E1 trail those in D1. 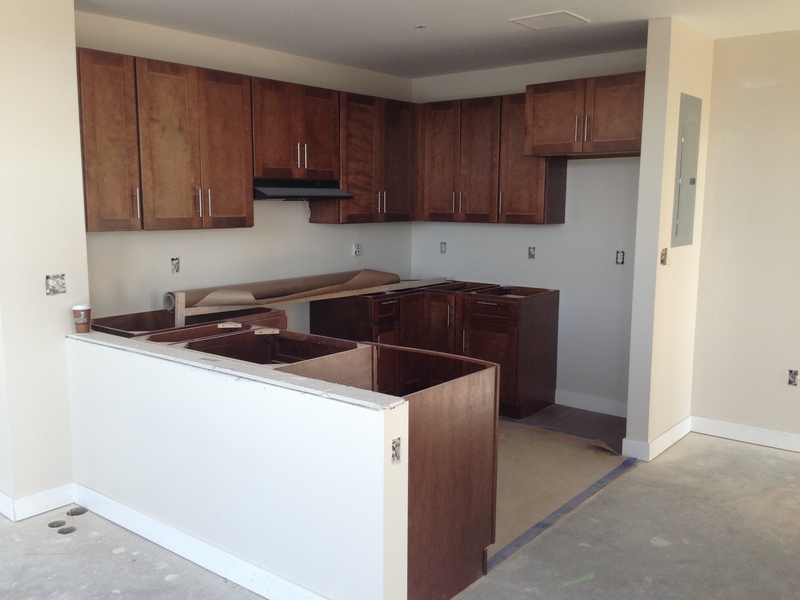 Here is a look at a kitchen on the 5th floor of E1, which will be the last floor to be finished in that building. Counter-tops and appliances need to be installed in the kitchen, and the rest of the unit will get flooring. The interiors of C-block townhomes are moving just behind the interiors of E1. 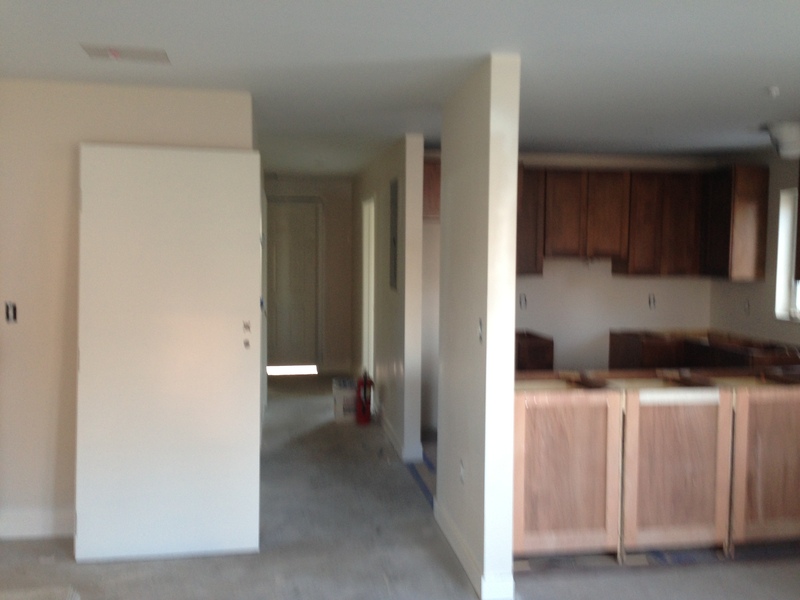 Here is a look inside C1, where countertops, appliances, flooring, and the last interior doors remain to be finished. 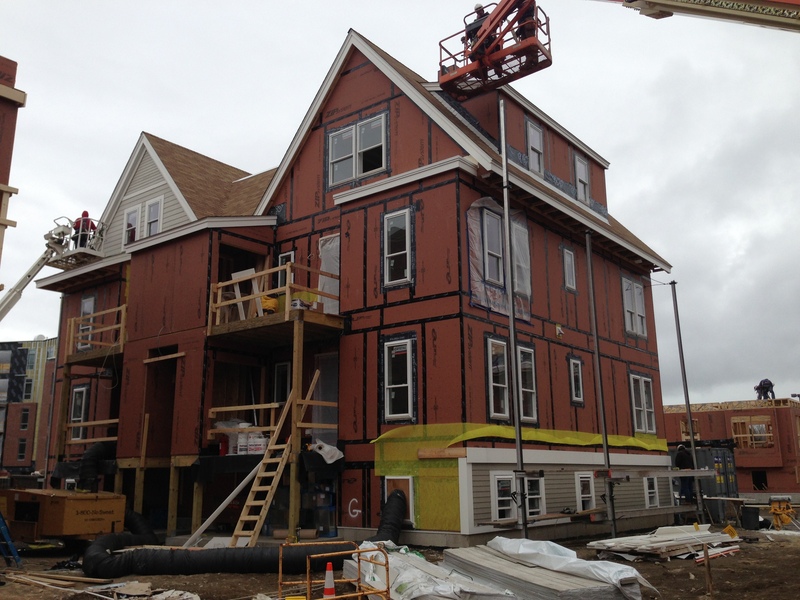 Outside on C-block, siding, hardie trim, roofing, and other exterior work is complete on 3 of the 5 townhomes. Next door on A-block, final exterior work has begun with trim and siding. Interior work on A-block is also gearing up to begin now. With framing complete on A-block and finishing on Building E2, crews have moved over to B-block and will begin on D-block next week. There are 54 framers on site most days now, but during days like today with snow or freezing temperatures framing work must pause. Below is B5 framed to the roof and B6 moving onto the 3rd floor. With framing approaching completion on E2 exterior work there has continued with window and granite installation, as seen below. Inside E2, crews are doing the rough-in for mechanical, electrical, and plumbing systems. 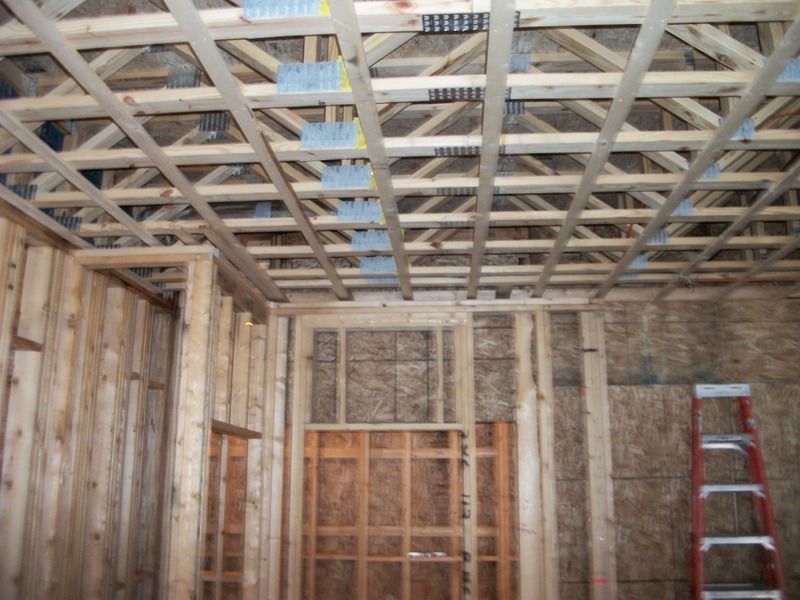 Drywalling has yet to begin in E2, so wood-framed interiors can still be seen. 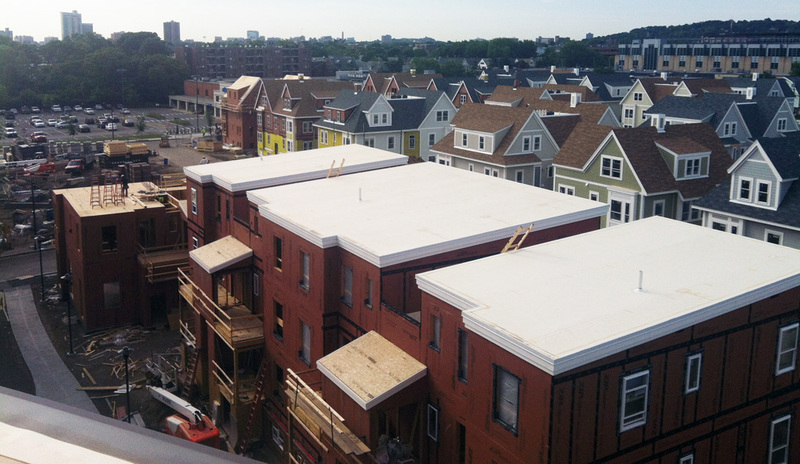 The framing crews that finished E2 will begin framing D-block townhomes next week as the panelized materials arrive on site. The foundations for those townhomes can be seen in the foreground below with the mid-rises in the background. This summer, the new Charlesview, Inc. office will be on the foundation seen in the center of the photograph. The background of the photo above also shows the exterior work of the E1 mid-rise moving towards completion. 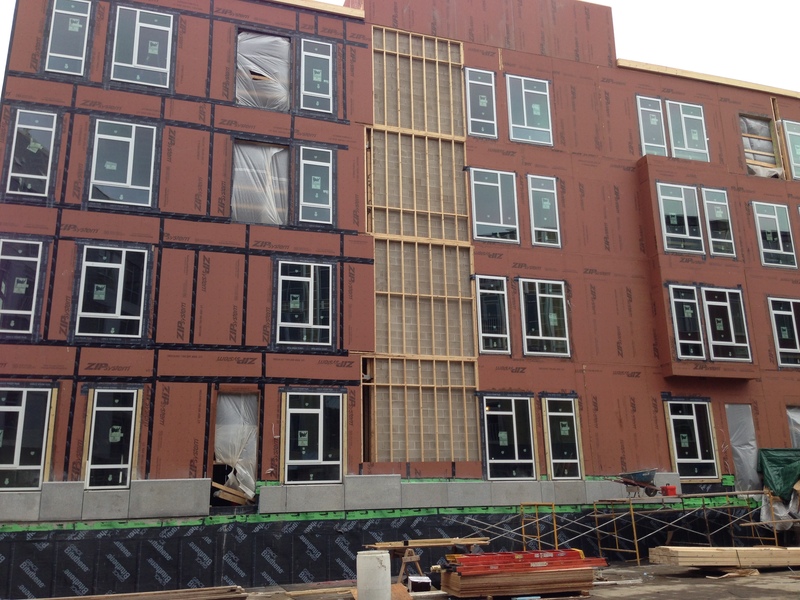 Yellow insulation can be seen on the building’s west face where metal panel installation will follow. The development is now about 75% construction completion, so this fascinating range of conditions will not last for long as our crews hustle towards the finish.